"Galloping Gertie" in its last moments. Italian/Greek Campaign: The slow Italian advance against stiffening Greek resistance reaches its point of maximum advance along the coast on 7 November 1940. The Italians that have crossed the Kalamas River reach Margariti. On the Greek side, the Thesprotia Sector begins receiving reinforcements from Katsimitros. On the other fronts the situation remains unchanged, with the Greeks gradually destroying the remnants of the Julia Division on the Pindus front. The RAF raids Valona, Albania, a big Valona air base. The planes come in low and strafe the field in addition to bombing it. European Air Operations: After dark, RAF Bomber Command sends 50 bombers against the Krupp munitions factory at Essen, synthetic oil installations at Cologne, Dusseldorf blast furnaces, the Oberhausen docks in the Dortmund-Ems Canal, the port of Duisburg, Dunkirk Harbor, Lorient U-boat installations, and various airfields in northwestern Europe. The Luftwaffe attacks across the Thames Estuary and sends two attacks against Portsmouth. The attacks accomplish little. After dark, the Luftwaffe concentrates on London, hitting a children's hospital, and sends a few bombers against the Midlands and southwest. Overall, the Luftwaffe loses seven planes and the RAF five. Ten-victory ace Wilhelm Müller is killed in combat over England. The Tacoma Narrows Bridge giving a vivid demonstration of aeroelastics and resonance. Battle of the Atlantic: The Luftwaffe (KGr 506) attacks Convoy FS 28. It bombs and damages 1673 ton British freighter Astrologer. The crew manages to beach the ship, but a storm wrecks it on the 15th. Everyone survives. Other ships in the convoy also are damaged: 1993 ton British freighter Dago II and 2163 ton British freighter Medee. The Germans lose a Junkers Ju 88 to gunfire from sloop HMS Egret, which takes some damage. British 2645 ton freighter Herland hits a mine and sinks in the Thames Estuary northeast of Sheerness, Kent. There are 18 deaths. Free French 350 ton auxiliary minesweeper Poulmic hits a mine and sinks in the English Channel off Plymouth, Devon. There are 7 survivors and 11 men perish. Royal Navy 99 ton trawler HMT Reed hits a mine and sinks in the North Sea off Clacton-on-Sea, Essex. All 15 on board perish. Royal Navy 364 ton trawler HMT William Wesney hits a mine and sinks in the North Sea off Felixstowe, Suffolk. There are five men dead, the survivors are picked up by HMS Sheldrake and two nearby trawlers. Royal Navy submarine HMS Swordfish hits a mine and sinks in the English Channel off St. Catherine's Point, Isle of Wight. All 41 crew perish. Working in conjunction, a RAF Supermarine Walrus and destroyer HMS Milford damage Vichy French submarine Poncelet off Gabon. The submarine manages to surface, and then the crew scuttles the sub later. The crew is picked up by HMS Foxhound and Fortune except for Commander de Saussine, who intentionally goes down with his ship. Early in the morning just past midnight, German torpedo boat T-6 hits a mine and sinks in the North Sea forty miles off Kinnaird Head, Aberdeenshire. The torpedo boat is travelling with several other torpedo boats ( T.1, T.4, T.9, T.10 of the 1st Torpedo Boat Flotilla and T.6, T.7, T.8 of the 2nd Torpedo Boat Flotilla) operating out of Trondheim on a sweep off the Scottish coast. T=7 and T-8 pick up the survivors and then head back to France. Royal Navy submarine Utmost, damaged in the Bay of Biscay on the 6th in a "friendly fire" incident by HMS Encounter, makes it to Gibraltar. Convoy FS 330 departs from Methil. U-551 (Kapitänleutnant Karl Schrott) is commissioned. Royal Navy minesweeper HMS Bangor (J 00, Commander Jack Peterson) is commissioned. American submarine USS Gar is launched. It has been sponsored by the wife of Rear Admiral George Pettengill. Battle of the Mediterranean: The Italians attempt to retake Gallabat, on the Abyssinia/Sudan border, which the British have just taken. There are fierce dogfights overhead. The 10th Indian Brigade which took the base finally retreats under pressure due to tank losses and RAF losses. At the end of the day, the Italians occupy the town. Force H departs from Gibraltar, led by aircraft carrier HMS Ark Royal and battleship HMS Barham. The Barham actually leads a separate group that will split off from Force H. This is Force F, and it is carrying 2000 troops to Malta. The Italians are aware of these movements and send three destroyers to intercept Force F.
At Malta, Governor Dobbie sends a letter to Secretary of State for War. He expresses the impression that "it would not take a great deal to get the Italians to quit." He suggests replacing the large Wellingtons operating on the island with Blenheims (two of the Wellingtons recently crashed upon take-off). 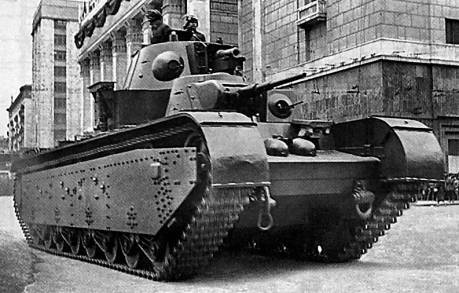 A multi-turret Soviet tank T-35 Model 1939, in the 7 November 1940 October Revolution parade. Battle of the Pacific: British refrigerated freighter Cambridge hits a mine in eastern approaches of the Bass Strait. The mine recently was laid by German raider Pinguin. There are 55 survivors and one man perishes. HMAS Orara picks up the survivors. The Pinguin and the Passat head for a pre-arranged meeting 700 miles west of Perth in the middle of the Indian Ocean. Spy Stuff: Tyler Kent, a cipher clerk at the US Embassy, is convicted of espionage in the Central Criminal Court in the Old Bailey. He is sentenced to seven years. Anglo/Irish Relations: Irish Taoiseach Éamon de Valera refuses a British request that it be allowed to use naval ports and airfields in Ireland. 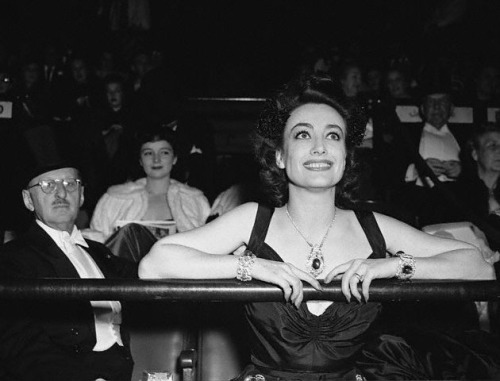 Joan Crawford takes in the National Horse Show. 7 November 1940. Say what you will about the old days, folks knew how to dress. 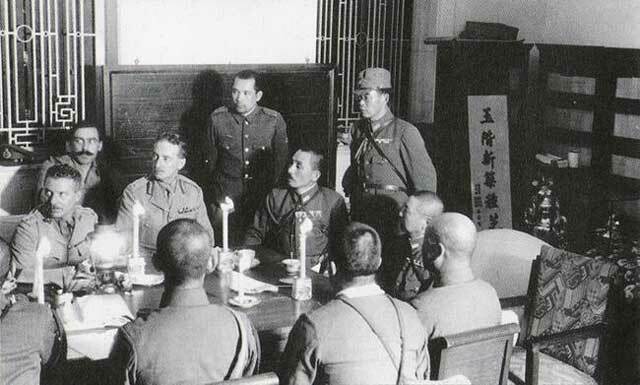 German Military: OKH Chief of Staff General Franz Halder has a meeting with Colonel Heusinger and his adjutant, Major Gehlen. They review Heusinger's preliminary plans to invade Greece from Bulgaria, as adjusted by Halder. Key issues are the fact that German troops would have a long march through Poland or Hungary and through Romania. Once they reached Bulgaria, moreover, the launching points themselves would be remote and conspicuous to the enemy. In addition, the Greeks have fortified the border with the "Metaxas Line" chain of barriers and fortresses. Even after the German troops broke through this line, they would be far removed from their allies, the Italian troops in the west, and require breaking out of Thrace over inhospitable terrain. This would create supply issues, no small matter with an advance by 100,000 men or more. Thus, the Wehrmacht would face large problems even before they began the campaign. All of these issues point to a single solution: take the short route through Yugoslavia. That is something that Hitler already has considered, and of course the decision rests with him. This all eventually comes under the rubric of Operation Marita. Gabon: Free French troops of the Foreign Legion land at Libreville. They arrive in troopships Fort Lamy, Casamance and Nevada. These troops are necessary to complete the conquest of the territory, as Vichy French troops still control key areas. The Free French forces are under the command of Colonel Leclerc. The Vichy naval forces are operating in the area. Submarine Poncelet attacks troopship Milford but misses. It then is attacked as described above under "Battle of the Atlantic." Australia: In the "Blue Draft," which is the training of RAAF pilots in Canada, Draft No. 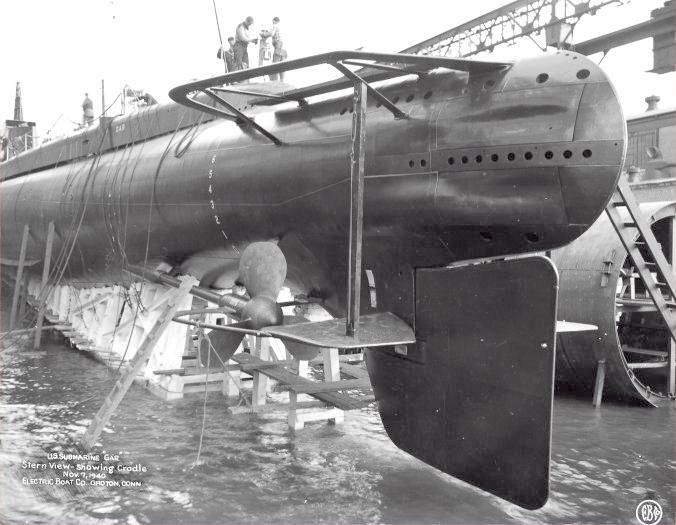 3, which had embarked at Sydney on 16 October, arrives in Vancouver. American Homefront: Pursuant to the meeting between engineering Professor F. Bert Farquharson of the University of Washington and state engineers on 6 November, state bureaucrats are drafting up contracts to modify the brand-new Tacoma Narrows Bridge. Farquharson recommends installing wind deflectors in order to disperse the effect of the strong gales that sweep down the river valley during the fall change of seasons. Professor Farquharson has found from studying scale models of the bridge that these winds can cause extreme oscillations in the bridge deck, vertical wave motions that cause the roadway to "bounce." Well, you learn something new every day, right? Farquharson's studies, however, have taken about eight months to complete and lasted into the high-wind autumn season that is most dangerous. The condition, which has given the bridge the nickname "Galloping Gertie," has been noticed by bridge workers and others even before the bridge was completed. Now, with all of their boxes checked - formal study completed, conference held to discuss the issue, higher officials notified and so forth - state engineers finally take steps to correct the issue. They understand the urgency and plan to implement the remedies within ten days, which is extreme speed for such a massive project which requires making architectural sketches, obtaining steel and other materials, and finding workers. At this point, Mother Nature intervenes. Before dawn, the winds pick up from the southwest. 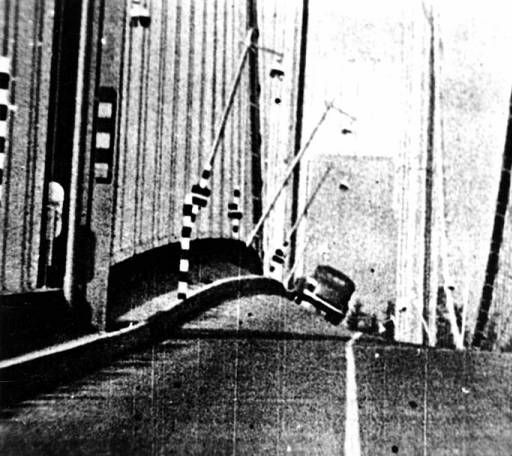 As it has before, the Tacoma Narrows bridge begins undulating, or "galloping." These are not small waves - some are as high as 5 feet high. The wind speed increases after daylight, and reaches 38 miles per hour at 07:30 and 42 mph at 09:30. The chief bridge engineer drives across the bridge at 08:30 and decides that the undulations, while noticeable, are not as large as in some previous instances. Professor Farquharson arrives at 09:30 from Seattle and begins filming the bridge for his engineering study, with no notification that anything unusual is in store. The undulations are so intense that a college student walks out on the bridge around this time "for a thrill" and to watch a coast guard ship, the Atlanta, pass under it. Just before 10:00, the last few vehicles pay their tolls and start driving across. At 10:30, the bridge adds a lateral twisting motion to the vertical oscillations. The movements seem to feed on each other (resonance), and the undulations reach 28 feet, with the roadway tilting 45 degrees. The State Police close the bridge, but there are people still on it, some clinging to the railings for their lives. One of the cars gets tossed against the curb, and the driver crawls on the roadway toward one of the towers. The Tacoma News Tribune hears about the situation and sends out a photographer. At 10:30, the bridge starts coming apart, with concrete chunks falling into the river. The winds die down for a little while, but soon pick back up again. 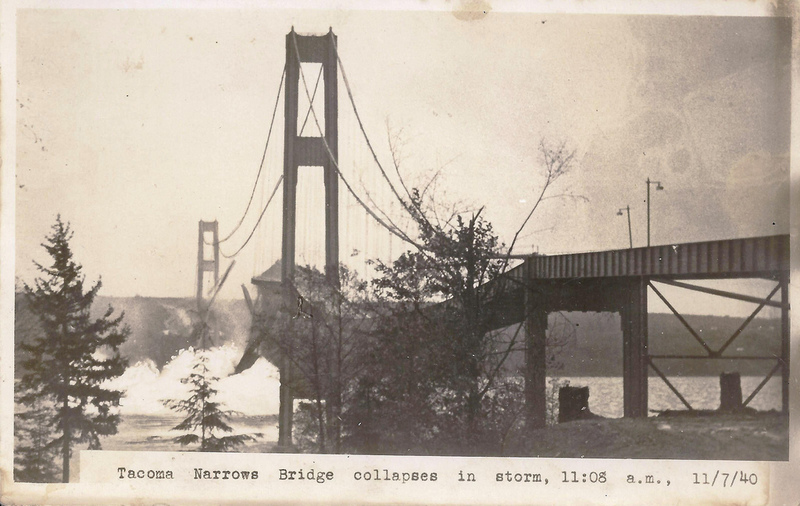 At around 11:00, the bridge span begins to rip apart. The entire span then starts ripping from the cables which hold it up. Farquharson, who has run onto the bridge to save a dog left in a car, runs for his life as the bridge starts oscillating in 60-foot waves (the dog, Tubby, wedges himself under the seat, biting the owner who tries to get him out). The entire bridge then twists apart and crashes into the river at around 11:10. The event receives world-wide attention due to excellent color filming of the collapse. American POWs in the jungles of southeast Asia a few years later report being ribbed about the incident by their guards, who find it quite amusing. The bridge only lasted four months. Incidentally, the concrete remains of the bridge that fell into the river remain in situ, forming a natural reef. New bridges with better wind tolerance have replace the collapsed bridge.